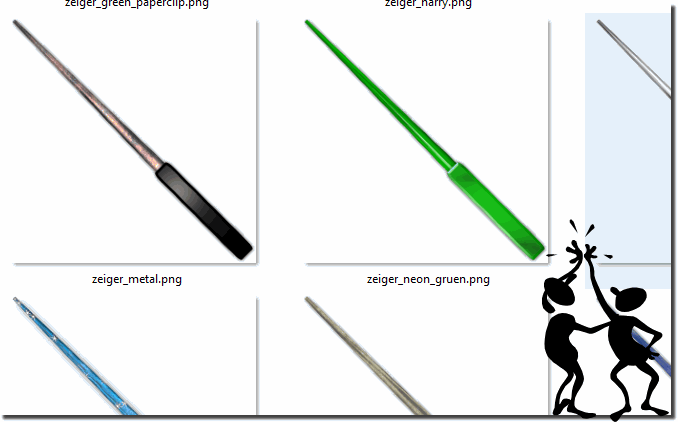 From version 3.66 it is possible to extend the Pointer Stick under Windows with your own pictures! If you want that the PointerStick present or use your own images as a extended mouse pointer, Put the images on the main program by using a simple drag-and-drop operation. After this, the pointers appear in the selection box and can be easily selected! I have a few prepared here as an example: ► ... Pointer_Example.zip! Please always use ... the latest version of the extended mouse pointer! (Image-1) Own images for the extended Windows mouse pointer! (Img-2) Own pictures for the extended Windows mouse pointer! The user request for this feature! I just wanted to first tell you how much I like your program. I use my computer from my couch and have found my cursor hard to see. Microsofts default cursors are pretty boring so I like to customize my cursor to my liking. The problem is there is no way to set the size of custom cursors. In looking for alternatives, PointerStick is the only program at all that will allow this. My only question for you is why you would not allow the user to import their own custom .BMP image? Is this a purposeful decision by you or an oversight? I would like to permanently change my cursor with PointerStick but only if I am able to change the cursor to something more useful to me. I would be willing to donate if this feature were implemented. Also, one more thing comes to mind. It seems the "Hide System Mouse Pointer" is slightly defective? Instead of hiding the windows cursor, it simply flashes on and off during movement. Perhaps I'm doing something wrong. 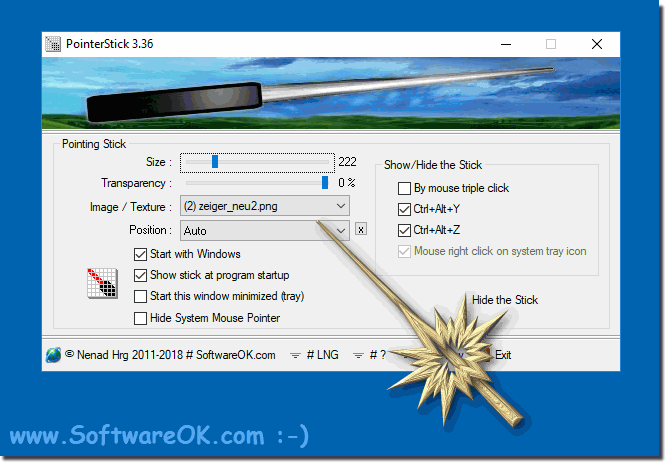 PointerStick - FAQ-6: Own pictures for the extended Windows mouse pointer?